This headband is stunning. Featuring ivory white coloured faux pearls. Elasticated to fit. Stunning 1920s/30s style feather headpiece. Featuring real feathers, silver tone rhinestone centrepiece headband and mirror effect plastic tiles and silver diamante base. Elasticated to fit. This headband is beautiful. 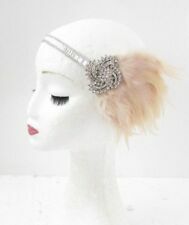 Stunning 1920s/30s style feather headpiece. This headband is beautiful. 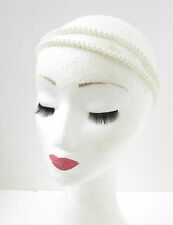 Featuring real feathers, white and silver/clear beading and white elasticated headband. Elasticated to fit. This headband is stunning. Featuring dark silver/charcoal coloured faux pearls. Elasticated to fit. Flapper Headband Peacock: 100% handmade with blinking crystals, peacock feather, and black sequins. Sequins Headband: good for 1920s 1930s party, prom and art deco occasions. Peacock Headband 1920: free size, one size fits all.